Hello! I have a bunch of stuff going on, so let's get to it. 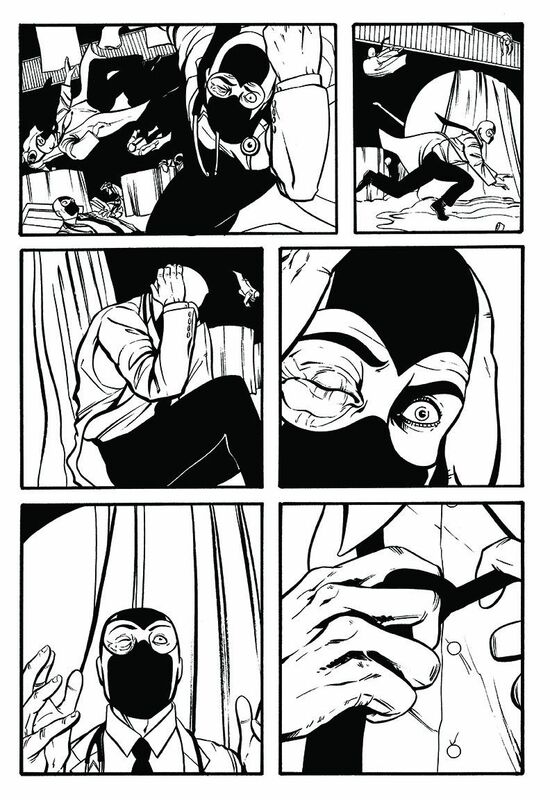 First up, some news about the Dr. McNinja books. Since the webcomic has ended, I've been asked at least a couple times a week when the last book collection will be released. The answer from our publisher is (and I paraphrase) "maybe when sales pick up on the current volumes." I will also be honest and say this might be your last chance to get these books. There are no current plans for reprinting. On the other hand, if a bunch fly off the shelves, that could change too. Thank you as ever for your enjoyment and support of this comic! Buy here! Killer Robot Games, the folks behind the Dr. McNinja card game, Legendary Showdown are making a new expansion to the game! Legendary Showdown: Presidential Edition. It's fun on it's own, or added to the the previous Legendary Showdowns. There are some Dr. McNinja related extra Kickstarter goodies too, so give it a look. I AM GROOT #1 is out! Preview here. THE UNBELIEVABLE GWENPOOL continues to come out every month (or occasionally twice a month). This week, we kick off our new arc, BEYOND THE FOURTH WALL, which has Gwen returning to "the real world" and going even deeper into the "what happens if you know you are in a comic" rabbit hole. Preview here. Also out: GWENPOOL trades volumes 1 and 2, with 3 coming soon. Find them at your local shop, or on Amazon. The only convention I currently have scheduled for 2017 is Awesome Con in Washington, DC, coming up soon! It's June 16-18th. You can find me in Artists Alley, #O2. Finally, I'm directing several excellent live sketch comedy shows at the Magnet Theater in New York City. There's TOTALLY METAL, a one night sketch show from the beloved NYC improv team, Metal Boy. Sunday June 11th at 9pm. Tickets here. There's also the NITRO GIRLS! The Nitro Girls are a Magnet house sketch team that I direct and they are consistently hilarious. Come see one of their shows! 06/12, 07/17, and 07/24. Magnet Theater has more info. Okay I'll leave on a teaser. ;) THIS SUMMER: EDGE OF VENOMVERSE #2. Go see the massive update at drmcninja.com! I'm not reformatting the whole thing for this site I'm pretty sure nobody checks! But to summarize: I'm writing a ton of books that are coming out at some point, including VOTE LOKI, GWENPOOL, ADVENTURE TIME, and a standalone ADVENTURE TIME: FIONNA AND CAKE. I'm going to New York Comic Con, and you can find the details on the EVENTS tab. Finally, I've got a schedule of sketch comedy you can see me perform on that tab as well. Oh my goodness look at these rude coasters I designed. So rude. A video I wrote and starred in for Wendigo. Of all the sentences I’ve read in comics news this week, none have been as much of an emotional rollercoaster as this one: Ryan North is leaving the Adventure Time comic, and will be replaced as writer by Christopher Hastings. That's right! Starting with Issue #36, out this coming January, I'm the new writer on the Adventure Time ongoing series, with art by Zachary Sterling. Ryan North's a dear friend, and I'm honored to be taking the reins from him. I am also terrified to fill his enormous shoes. Ryan's Adventure Time run is one of the finest collection of humor comics out there, (multiple awards and the ridiculous sales numbers agree) and he'll be a tough act to follow. I recently got placed on a Magnet Theater sketch ensemble team called Wendigo! It's a great group of writers and performers that comedy nerds are calling "stacked." Every month we're putting on a 25 minute live show of material we've written, and it's going great! If you're in NYC, come check us out! The dates are up in the Shows and Events section. I wrote a comic book that is out today! You can pick up Deadpool Annual #2 at your local comic shop or digital comics thing.